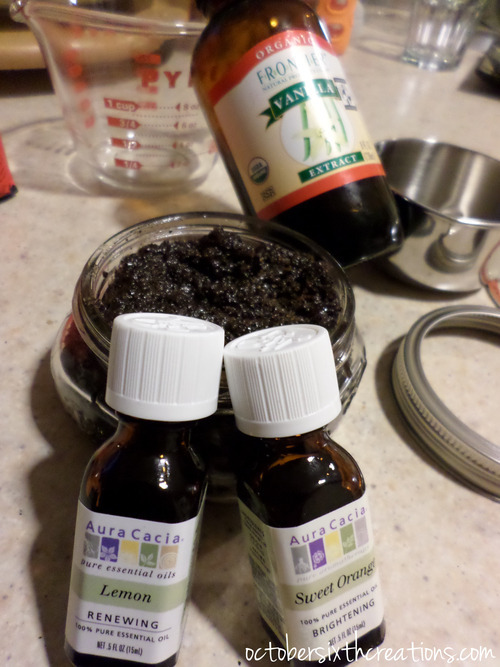 I have been wanting to try out a coffee scrub for some time. I have heard great things about it bringing your skin to life or back to life. A lot about it helping with cellulite. Crushed coffee beans are supposed to release a bit of caffeine into the skin to help circulation. Plus you get some exfoliation action. If you do this scrub before a shower as you wash away the coffee give it a bit more of a scrub on your body this will help release into the skin. Obviously the longer you leave on your skin the longer it has to soak in. I have this grand plan to have lots of time to sit in my bathtub sans water covered in coffee scrub while watching a movie on my ipad. Doubtful that will happen,but you never know. Another motive for making this was my friend. We had been talking about diy beauty. I mentioned the coffee scrub. She seemed really interested so I decided to make it as a holiday gift. ½ cup of a sugar. I used Turbinado. You can also do coconut sugar. Mixed in bowl. It will be a bit gloppy. Wait for a bit as the coconut oil sets back to a more solidish form. Then mix is up. Put in your jars. done! If you are in warmer climates you may need to play with the amount of coconut oil. Or you may need to set it in the fridge and store it there as well because coconut oil in warmer places stays liquid. Are you making any gifts for the holidays? Let me know. I love ideas. Happy DIYing everyone!